Laser ablation of glass allows for production of microfluidic devices without the need for hydrofluoric acid and photolithography. The goal of this study was to compare the separation performance of microfluidic devices produced using a low-cost laser ablation system and conventional wet etching. During laser ablation, cracking of the glass substrate was prevented by heating the glass to 300 °C. A range of laser energy densities was found to produce channel depths ranging from 4 to 35 μm and channel widths from 118 to 162 μm. The electroosmotic flow velocity was lower in laser-ablated devices, 0.110 ± 0.005 cm s−1, as compared to wet-etched microfluidic chips, 0.126 ± 0.003 cm s−1. 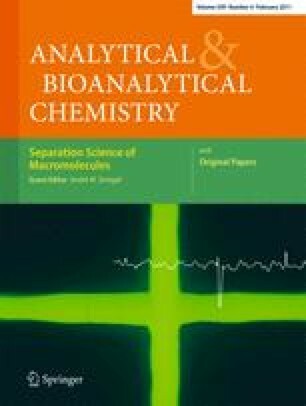 Separations of both small and large molecules performed on both wet- and laser-ablated devices were compared by examining limits of detection, theoretical plate count, and peak asymmetry. Laser-induced fluorescence detection limits were 10 pM fluorescein for both types of devices. Laser-ablated and wet-etched microfluidic chips had reproducible migration times with ≤ 2.8% relative standard deviation and peak asymmetries ranged from 1.0 to 1.8. Numbers of theoretical plates were between 2.8- and 6.2-fold higher on the wet-etched devices compared to laser-ablated devices. Nevertheless, resolution between small and large analytes was accomplished, which indicates that laser ablation may find an application in pedagogical studies of electrophoresis or microfluidic devices, or in settings where hydrofluoric acid cannot be used. Christopher A. Baker and Rayford Bulloch contributed equally to this work. Published in the special issue Separation Science of Macromolecules with guest editor André Striegel. This work was funded in part by a grant from the National Institutes of Health (R01 DK080714). We would like to thank the faculty and staff of the Florida State University FormLab for their work in administering the laser etching facilities. We would also like to thank Dr. Eric Lochner in the Department of Physics at Florida State University for acquiring the SEM images.